What could be more important than protecting your data? Overland Tandberg Data has been renowned for its high-quality products for many years and Overland Tandberg Data media is subject to stringent quality controls and measurement in order to ensure quality and reliability. LTO (Ultrium™), the most popular tape technology, is a high-performance tape technology offering versatility, reliability and performance. Overland Tandberg Data Tape Media and storage products are the result of many years of joint development and continuous enhancements. This helps to meet the increasing capacity, performance and cost-efficiency demands. The industry-leading quality and reliability of our products is acknowledged by leading international OEM customers. Our partners are dependent on optimum data security for their mission critical data storage needs. Using Overland Tandberg Data branded media with Overland Tandberg Data branded storage products assures industry-leading performance and data security. Overland Tandberg Data media is always the right choice because it is designed to work with our products. To achieve and maintain the maximum benefit of your Overland Tandberg Data branded storage product, we recommend to use Overland Tandberg Data media cartridges with them. Use Overland Tandberg Data media to assure Overland Tandberg Data quality. 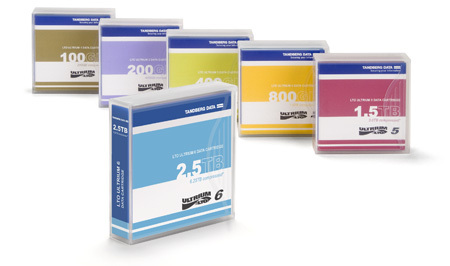 Overland Tandberg Data cartridges allow users to perform 200 complete backups and archive data for more than 30 years. Download the Overland Tandberg Data LTO Media Datasheet(PDF).